Luminous, blue flash labradorite briolettes are topped with delicate briolettes of apatite and rainbow moonstone. To me, the colors and overall look remind me of butterfly wings, so I have named these 'Blue Morpho'. All stones are AAA rated and hand cut for me. Each individually and meticulously wire wrapped using the most delicate gauge of 14kt gold filled wire. Each stone is hand selected for quality, as well as appropriate scale in my work. No detail is ever overlooked! ~Approximately 1 7/8" in length. 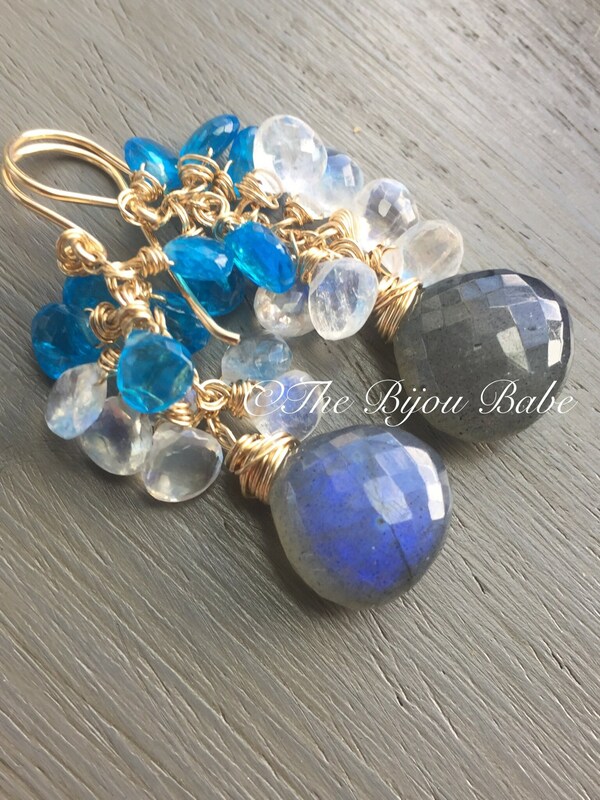 Your 'Blue Morpho' earrings will ship USPS Priority Mail in the US, and will be packaged in a signature "The Bijou Babe" gift box.